When David Hockney’s exhibit opened this past fall at the de Young, a fine arts museum located in San Francisco's Golden Gate Park, I discovered it included 150 iPad images. I reluctantly joined the 21st century when, three years ago, my grandchildren gave me an iPhone for my 70th birthday. They also helped me learn how to use it. This past December, I purchased an iPad Air, and I am still trying to figure out how to use Brushes, the app Hockney uses to make his pictures. No doubt, I will need to schedule a session with my 10-year-old granddaughter to learn how to do so. Apparently, artists, illustrators, and graphic designers are snapping up other programs like Touch Sketch, StetchBook Mobile and Bamboo Paper. Last month, I read a review of “Tim’s Vermeer,” a documentary in which Tim Jenison “discovers” whether Johannes Vermeer (1632-75) used optical tools when he created his paintings. How do we determine creativity? How do we uncover aesthetic quality in a work of art? When Dr. Barnes evaluates the art in a painting, what does he say we must do? I asked you to look at this painting because it served as a turning point for me as I endeavored to use and teach the objective method. In the 1980’s, I was teaching children to paint, and during the painting lessons I included about 20 minutes of art appreciation, primarily introducing them to the traditions of art. I wanted them to trust their perceptions and to express on canvas the meaning of their own visual experiences. I wanted to nurture creativeness, not teach them a skill or a technique. I decided to build a background of knowledge so they could have it at their disposal for personal use when they needed it instead of seeking it only after they had reached an impasse. When I began to attempt to teach the traditions of art, my grasp of the ideas did prove to be far less than secure. Because of this, I unwittingly strayed back to the old, the easy way, the well-beaten path taken by nearly all art historians and art critics—a crowded path, smoothly paved and abundantly supplied with markers. Its most seductive characteristic: it caters to our native curiosity without requiring on our part any great exertion of intellect or imagination. When I prepared my lesson on Vermeer and the Dutch tradition, I found myself fascinated by the book, Jan Vermeer, by Arthur K. Wheelock, Jr. (Harry M. Abrams, Inc., New York, 1981). I read of Jan Steen that “by 1654 he had already established himself as a genre painter in the tradition of Adriaen Van Ostade, but as one with an unusually rich sense of humor,” a feature that, according to the author, distinguished Steen’s painting from that of Vermeer (p. 21). 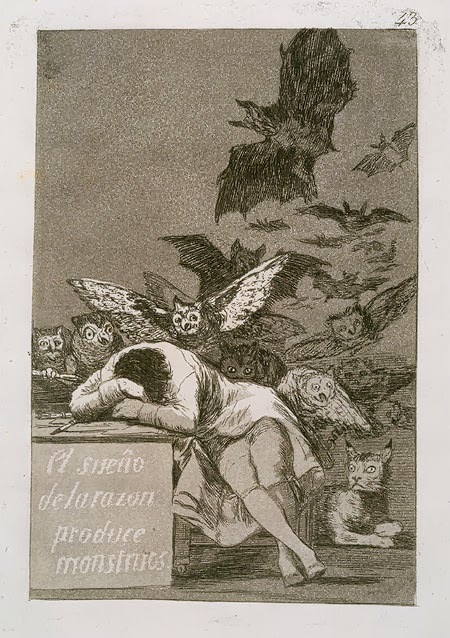 I also became obsessed with symbolism, iconography, and pictorial devices. Light, line, color, and space went out the window. When I finished my fact-filled talk on subject, camera obscura and Vermeer’s use of it, along with Hans van Meegeren forgeries of Vermeer’s work, I used up my 20 minutes. After that, I pulled myself together. I realized I had taken the road most traveled. I knew I had to do just what Dr. Barnes had done before me: use objective analysis to do some painstaking looking, classifying, organizing, studying, and looking some more, until I discovered verifiable principles. This takes time and effort, and that is the reason for which the other, the easy, the trouble-less, ways are so seductive. 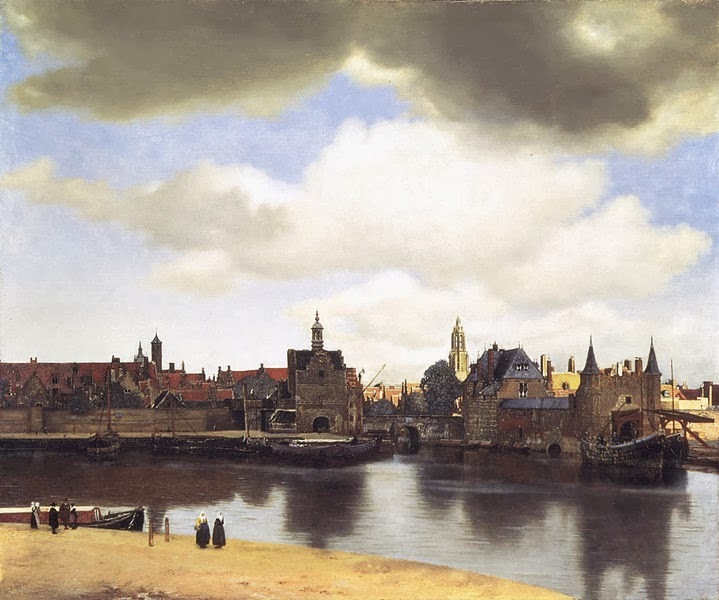 Yes, Vermeer spoke in the idiom of his time when he used mirrors, clavichords, and maps as his subjects or used the camera obscura to study optical images and effects. But the question is not what he used. Rather it is what he did with what he used that made it new and different and his. Instead of “Beauty is as beauty does,” I would say, “Influence is as influence does and is done unto and with.” And that includes technological influences. That’s what I call a breakthrough! He goes on to say horizontal elements extend across the picture. Starting at the top, a band of darker clouds and two bands of lighter clouds alternates with strips of blue. The area of buildings-and-trees follows. The canal and the reflections in it join the triangular bank in the foreground. The clouds, my children noticed, puff and curl across the sky, and move back in space. The row of buildings-and-trees moves in and out. The gables, steeples, and towers have much the same “up-ness” (their word) as the people and posts in the foreground. The reflections in the water carry this vertical pattern to the area of the canal. The horizontal bands each contrasts with a subsequent band: the gray-white sky sets off the darker, more solid and compact blue-red-green shapes in the center. These, in turn, contrast with the gray-brown water. And the water contrasts with the tan-yellow bank in the foreground. Contrast of light and dark is the essential characteristic of this landscape as it is in the Dutch tradition. You see this easily in the contrasting bands, but you need to look more closely to see the remarkable internal pattern in each area. This is hard to see in a digital image, but the central golden rectilinear band on the far right is flooded with light while rich red and brown spots function as dark; above it, the ivory wall subtly modulated with bright red is light. In the adjacent section of this wall, right above it, the relation of dark to light is reversed; the ivory strip is at the top and the brownish section is below. In the sun-lit area of the ground, its ivory tone tinged with red and blue, creates a note of contrast with the adjacent area below it which is modulated with grayish blueish-green. 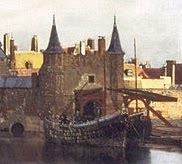 In the section of buildings to the left of the boats, the wall and turret function as the dark element in contrast to the sunlit, modulated, yellow-and-red roof directly behind it. The figures, posts, docked small boats, and orange-red ground all continue the dark-light, rhythmic motifs in a vertical format. They exemplify the space-composition seen in the entire picture. The space-distribution of masses in the row of buildings-and-trees is a succession of variedly shaped, colored, and illuminated gables, walls, towers, chimneys, set at intervals which also vary in expanse, depth, and color and light. If you own The Art in Painting, please read Dr. Barnes’ analysis of this painting with a high quality image on your screen. Better yet, go to the Mauritshuis to see it. It will be worth the trip. I do not generally quote and paraphrase Dr. Barnes in such detail, but it was just his analysis of View of Delft that reinforced my commitment to this method. With his help, I could guide my students to experience the art in this picture. It restored my faith in the method. For practice in evaluating the influence of technology on works of art, I ask you to consider the following two images. 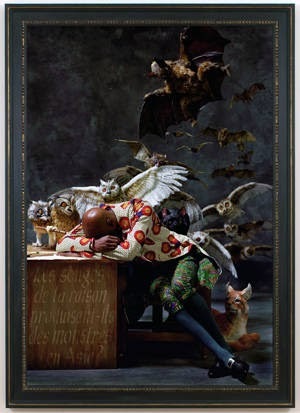 The first is by Goya; the second is by Yinka Shonibare, MBE, and his work is currently on exhibit at the Barnes Foundation. If you send me your reactions, I will include them in the next post. Just click here: Marilyn’s email. I was thinking the other day how paintings came about, during their time, because it was the only way to capture a scene in history. Then photography was invented. Photographs did not destroy paintings. It only made them more important and meaningful as art. I think these new digital tools will create a new kind of art that, like photos, will not replace existing art, but rather add to it and distinguish it further.